Egg Box profiled acoustic tiles are a popular choice for reducing reverberation in rooms used for music practice or studios. Because its surface resembles an egg box type profile, it presents a more efficient sound absorbing surface. Inexpensive method of controlling a room’s acoustics. Egg Box type profiled sound absorbing foam tiles are designed to reduce reflected sound in studios and music practice rooms. Their undulating surface is a more efficient way to absorb a greater range of frequencies and is an inexpensive way to bring a room’s internal acoustics under control. The product is available in two thicknesses of 40mm and 73mm which should be used as a random mix that will help control lower frequency reverberation. Depending on their overall size of either 381mm or 762mm square, the tiles are supplied in packs of 6 or 24 and both cover an area of just under 3.5 square metres. Although our Egg Box tiles are flame resistant to normal furnishing standards, if a non-flammable tile is required we can suggest the use of our 30mm thick Echosorption tiles. No music studio will give the best sound performance unless acoustically tuned to reduce bass noise build-up, reverberation and standing waves and our Egg Box profiled sound absorbing tiles will help as part of the overall treatment to bring a music practice room or studio into full acoustic compliance. We can also supply Acoustic Corner Traps and cubes that will compliment the tiles to get the best acoustic results from your room. DOES SURFACE OF FOAM MAKE A DIFFERENCE TO SOUND ABSORBING PERFORMANCE? The short answer is yes and both profiled surfaced foam and flat foam surfaces will absorb sound. Flat surfaced foams make efficient sound absorbers due to their greater degree of sound absorbing foam but the range of frequencies they absorb is usually more limited. 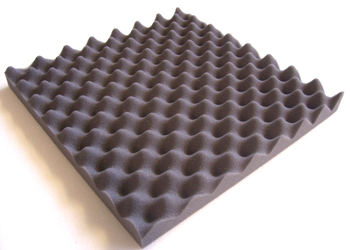 Egg Box profiled foam on the other hand has a range of differing thickness and a greater surface area of foam that makes the foam more effective at absorbing a greater range of frequencies. Generally, the more foam there is the better the sound absorbing performance will be and flat surfaced foam will absorb lower frequencies and the thicker the foam is then lower frequencies will be absorbed. Low frequency sound has a longer wavelength requiring thicker sound absorbing foam to effectively soak it up. Sound absorption is similar to water absorption such as with a bath sponge soaking up water. The thicker the sponge is the more water it will absorb and the same goes for sound absorption. 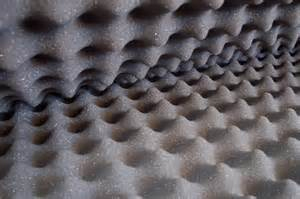 If the sound absorbing foam is thicker, it will absorb a greater range of frequencies with the emphasis on the lower end. But care must be taken to allow for upper end absorption as well so thinner foams are also required to cater for these. This is why Egg Box foam is so important because it comprises a range of sound absorbing thickness’s making it more efficient at absorbing sound than say foam of the same overall thickness because it can effectively absorb a wider range of frequencies.